Maori radicalism, Maoism and anti-capitalism are all closely linked. Kaye-Maree Dunn is a Wellington based events manager and "neuro-semantics master practicioner". Yesterday she was outside a Rotorua courtroom protesting the arrest on firearms charges of Maori activist Tame Iti. Dunn told Maori broadcaster Te Kaea "I think the government's actions are atrocious, my friends are gentle and humble, they aren't terrorists". 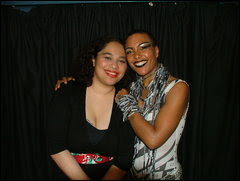 In the early '00s Dunn was a leading light in Victoria University's radical leaning Maori student group, Ngai Tauira. In early 2002, Dunn represented Ngai Tauira and "Te Iwi Maori" at the 15th conference of the Asian Student's Association at Thammasat Univesity Bangkok. ASA is of course a pan Asian grouping of radical and Maoist leaning student organisations. On her return, Dunn told Victoria University's "Salient", nunber 13 2002; "capitalism is the force that drives this and causes profit and money to be put beforethe welfare of the people. Simply put this is the root of all the suffering, wars, hunger, environmental destruction, displacement of indigenous peoples from their lands all across the world".